The LG Minibeam PH550 Projector is best understood as a portable big-screen TV. It just happens to use a 720p projector instead of a screen for its display. The TV part comes from the built-in TV tuner and the coax connector for an antenna or cable. The portability comes from the compact size, light weight, and rechargeable battery. As with most TV's today, assorted ports and wireless options let you connect other sources--including PCs, tablets, and phones--so you can use it as a standard projector as well. Roughly the size of a thick paperback and weighing only 1.5 pounds, the PH550 pairs a 720p (1280x720) DLP chip with an LED light source meant to last the life of the projector. LG rates the brightness at 550 lumens. However, it adds an asterisk next to the rating which we'll discuss below. As a practical matter, I found it easily bright enough for a 55" 16:9 image in a family room at night with the lights on. That's pretty impressive for a portable TV, especially one that's widely available for a little less than $550. Compared with 1080p TVs and projectors, the PH550's resolution limits the detail it can show. 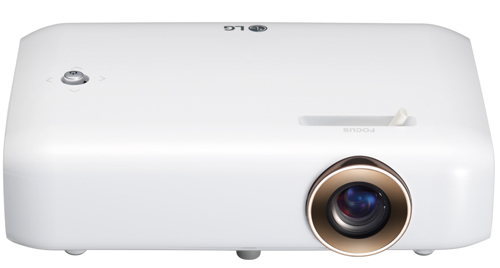 Compared with other 720p projectors in its brightness and weight class, however, the PH550 offers far better image quality than most. Color Preset Modes. The five color preset modes--Standard, Vivid, Cinema, Sport, and Game--are all customizable. Each automatically adds (User) to its name if you make any changes and removes the addition if you reset it to its default. There are also two user modes, called Expert 1 and Expert 2 to avoid confusion with the predefined modes with user customizations added. Using default settings, some colors are a touch too vibrant, giving them a nearly DayGlo effect. With video and other photo-realistic images, this extra vibrancy shows primarily with memory colors--like green grass or blue sky--in brightly lit scenes, and is most obvious in Standard and Vivid modes. It's far more subtle in Cinema mode, which offers the best color quality and a fairly close match overall to the calibrated projector we use for comparison. Unless you have a particularly critical eye, however, the color is within an acceptable range even in Standard and Vivid modes. Some people will even prefer it to more realistic color. With an HDMI connection, color balance is excellent in most modes, with suitably neutral grays at all levels from white to black. However, Sports and Vivid modes both show a slight tint with some midtones. With a VGA connection, the color balance is excellent in all modes. Rainbow artifacts are not an issue. The only time I saw them with data images was with one that's designed to bring them out, and even then, only when I shifted my gaze back and forth quickly. With video, I saw only a few in the entire time I spent with the projector. It's unlikely that anyone would see them often enough to find them bothersome. Data Presentations. Although the PH550 isn't designed for data presentations, it can easily handle them. The touch-too-vibrant colors are even less of a problem for business graphics than they are for video, and the projector holds detail well. One minor issue if you connect to a PC by HDMI is that you'll have to turn off overscanning, which is not available with a VGA connection but is on by default with HDMI. Overscanning makes the image a touch bigger, scaling it to a slightly larger size by adding a few pixels. This can be a problem for data images. It makes text harder to read, for example, and adds scaling artifacts to areas with closely spaced lines or dots. Turning the feature off is easy but the setting is more than a little obscure. You have to change the Aspect Ratio option from 16:9--which is the obvious choice if you're using 1280x720 resolution and the right choice with VGA input--to Just Scan. With overscanning off, white text on black in our tests was crisp and readable at sizes as small as 6 points, black text on white was highly readable even at 4.5 points, and there were no scaling artifacts in fills that tend to show them. Video. With video, overscanning ensures that the image fills as much of the screen as possible, but it also contributes to a soft-focus effect. You'll want to try both settings to see which one you like better. Beyond that, the PH550 handles video nicely. In addition to its near-excellent to excellent color quality, it did a good job of avoiding posterization and held shadow detail well, even in the most demanding text clips. When I connected the projector to a FiOS box I saw only a few rainbow artifacts over several hours of watching TV. Contrast ratio is notably low, with black showing as a glowing gray. This is particularly obvious in theater-dark lighting, where the glow shows in the black background behind scrolling credits or with the black bars in a picture-box format. With the lights on, however, a deep black would get washed out anyway. The somewhat-too-vibrant color also helps compensate for the low contrast ratio by giving the colors a little extra pop. However, last month, I paid 347.00 at Fry's during their anniversary sale. At 347 dollars, I would rate it much higher based on that price and your review. This projector is really awesome, however i returned it because the miracast functionality is not working properly, after 1hour of streaming the device stops. I tested this behaviour in three diferente units (LG PH550). Don't buy it if you want to use WiDi. I bought two of these projectors. One is sharp focus and one is fuzzy. I cannot understand why. Both are the same settings (factory default) and no changes of settings will make the fuzzy one as sharp as the other one. I cannot seem to get any information on this issue. It's also hard to complain to the company since a picture is being displayed and that is all that matters. Huh.. Oh, yes, the front of the lens is clean. This is a great article explaining how it will look in use. I have a similar issue as Janet. I bought one and it was fuzzy no matter how much I focused. I returned it and got another one. This one, focus is excellent. It doesn't mention it in the article but I think the lens is made of plastic, not glass. Appears to be easily scratched.